Home » Health » Do Tomato Seeds Increase The Chance For Kidney Stones? Do Tomato Seeds Increase The Chance For Kidney Stones? Tomatoes, a rich source of antioxidants and a delicious staple in most cuisines, are under the scanner for possibly causing kidney stones. Rumor has it that the oxalates in them (which could crystallize to form stones) may be concentrated in the seeds of this luscious red fruit. But before you give up on this nutritious food, take a closer look at the evidence. Tomatoes are easily one of the most popular ingredients across cultures and cuisines. Whether you’re popping them into curries, whipping up salads, boiling up broths or hearty stews, these recipes just wouldn’t be the same without tomatoes. A rich source of antioxidants, vitamins, minerals, and fiber, tomatoes bring a lovely fresh, tangy, and savory note to food. However, as amazing as they are, tomatoes, and the seeds specifially, are believed to cause kidney stones. But are these refreshing fruits (yes, tomatoes are fruits!) really to be blamed? Kidney stones are hard deposits of minerals, oxalates, calcium, and uric acid in the kidneys, formed through a process called precipitation. These stones do not develop overnight. Accumulating over months and sometimes years, tiny crystals build up to become bigger, more detectable stones. They sometimes lodge themselves in your urinary tract, obstructing the flow of urine and causing pain. This pain can be excruciating and is often compared to that of childbirth! People who are prone to stones tend to quickly go “off balance” and form stones repeatedly. Food And Kidney Stones: Should You Watch What You Eat? While many of us are told to avoid tomato seeds because they bring on kidney stones, the scientific community doesn’t necessarily agree. According to the National Institute of Diabetes and Digestive and Kidney Diseases, consuming specific foods is not linked to stone formation in otherwise healthy individuals who are not susceptible or considered “at risk” of kidney stone formation. But what of those who are considered high risk (say, those who are obese, have diabetes, or high blood pressure)?3 Does oxalate intake impact stone formation at all? According to one view, consuming foods high in oxalates can contribute to kidney stone formation in those prone to problems of the kidney. In fact, recent research points out that half the cases of kidney stones have major dietary associations. Excess oxalates in the urine harden and precipitate to actively form kidney stones that cause extreme pain and discomfort. Researchers say that a subpopulation of “hyperabsorbers” whose bodies absorb more oxalate from food than others are especially prone to stone formation due to high consumption of oxalates. Tomato Seeds: Good Or Bad? The University of Pittsburgh recommends that a diet that keeps oxalate intake at under 40–50 mg each day is safe enough to help you avoid developing kidney stones.5 Although tomato seeds do contain oxalates, the levels of oxalates in them are not high enough (5.3mg of oxalates per 100g of tomatoes) to contribute to kidney stones. What’s more, oxalate absorption rates from tomato seeds are lower than other foods. Interestingly, some studies even suggest that consuming tomatoes could actually lower your risk of developing kidney stones. In short, if you’re someone who doesn’t have a history of kidney problems, eating the juicy fruit on its own or cooked should not cause you any kind of urinary problems or kidney stones. If you’ve had a history of developing kidney stones, things shift a bit as your threshold for developing stones is lower than for other people. This is because your body is unable to strike the balance needed to maintain oxalates in a liquid state and consequently forms stones. You may therefore want to lay off eating too many tomatoes as the oxalate intake from tomatoes and their seeds, along with other foods rich in oxalate, may increase your risk. Tomatoes may have got more than their fair share of bad press, but for those with a history of kidney problems and kidney stones in particular, there is a longer list of foods to avoid or limit. This includes things like spinach, nuts, beets, chocolate, tea, and legumes like soy and parsley.8 It is also vital you keep your fluid intake to over 2 liters if you’re prone to developing stones, regardless of what you’re eating. Most people with a disorder of the kidneys have a problem regulating mineral levels, especially of potassium, in the blood. An abnormally high amount of blood potassium creates complications like an irregular heart beat and might even result in a heart attack. 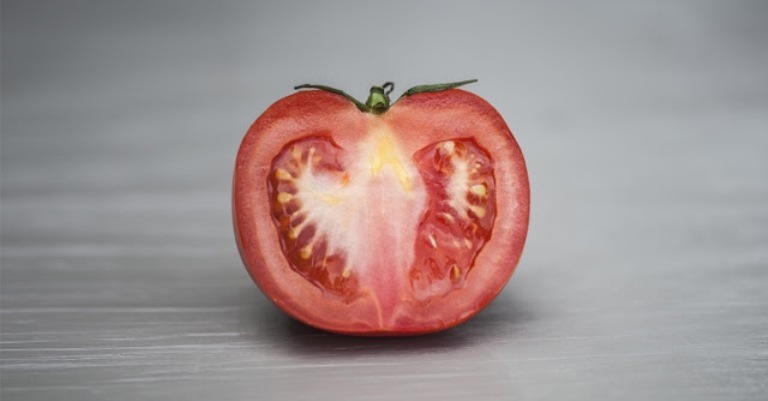 Since tomatoes are high in potassium content, they are usually avoided by those with kidney disease to keep potassium levels to the minimum.10 For everyone else, tomatoes are a great source of nutrition and eating them as part of a complete balanced diet is as good an idea as any.